Aside from and in addition to the glorious riches that we have in Christ spiritually, thanks to His death and resurrection, what tangible, earthly blessings have you experienced recently? Perhaps dancing butterflies, unexpected help, a radiant sunset, a timely compliment, fragrant honeysuckles, a pleasing invitation, beckoning bird calls, warm hugs, tasty home-cooking, playful kittens, a stranger’s smile, a recovered item, a close parking spot, nostalgic memories, moon-lit walks, or hand-written thank you notes? Gratefully, I have been blessed with all of the aforementioned in recent days and am presently smiling while reflecting on how extravagantly my good Father provides me with beneficial gifts to enjoy – ones that could be easily missed if not for eyes to see and ears to hear (which also incidentally come from Him). Several years ago, while fondly reminiscing about loved ones who had gone on to glory, I was struck in a new, personal, and poignant way by the profound realization that EVERY good and perfect gift is truly straight from the Lord’s hand (James 1:17). 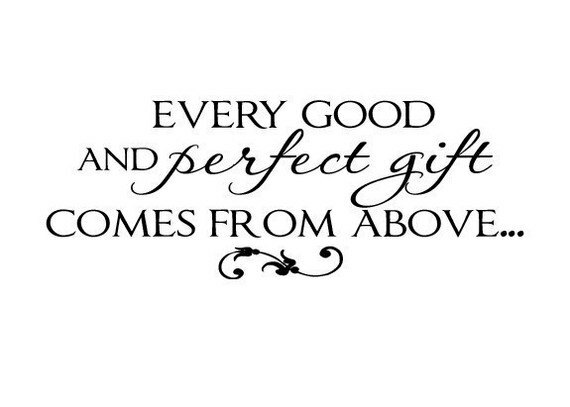 And not just that every good gift is from above, but that everything God gives is good and additionally that He will not withhold good from those for whom it is due according to His perfect knowledge and timing (Psalm 84:11, Luke 11:7-11 ). Who these loved ones were and what they did for me was all because of God creating them and living through them. Although I had known this intellectually, at that moment my opened eyes, hearing ears, and discerning spirit acutely realized that EVERYTHING and EVERYONE who was, is, or will be “good” in my life is due to my Father creating them, sending them, and enabling me to enjoy them. I now view these people, things, and experiences as extraordinary presents sent from my generous Father Who spares no expense in showing His love for me – from sending His Son to die for my sins to dancing butterflies. My hope and prayer is that this will be your experience as well!